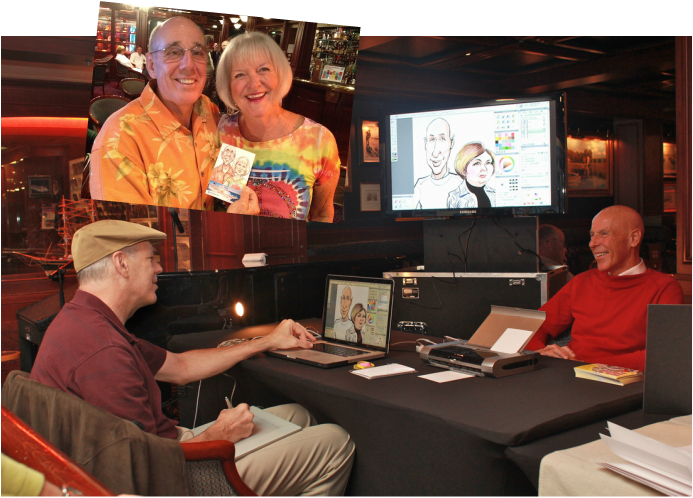 Funny how jobs come your way... A caricaturist in Canada was contacted by a Canadian company to draw a group picture. He was unable to do this last minute project so he sent them to Rick Wright, a great friend of mine up in Baltimore. Rick didn't have time either (the client needed it back immediately) so he sent them to me. This is how it turned out, the client loved it.. 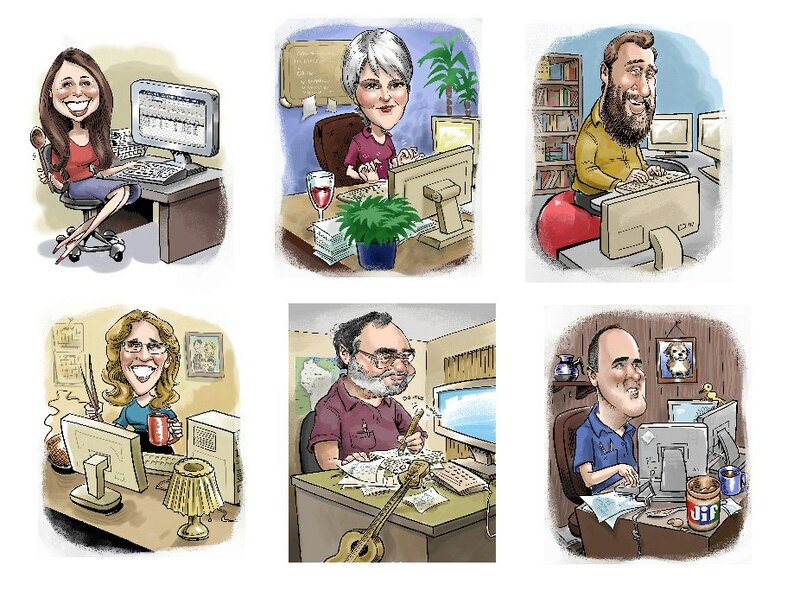 Many companies want to represent their team members with caricatures as opposed to photos. These were drawn digitally for such a company . Just finished a successful conference in SW Georgia, and late last night Pip & I worked a college in eastern North Carolina. Nice students... thank you late check out time. Today we have a little R&R in Charleston. We lucked out with the weather.. not too extreme. I've been drawing caricatures for 38 years professionally and over 20 digitally and never have I had so much fun drawing as when my girlfriend and I create our respective artforms cruising back and forth to Europe. We have met so many wonderful passengers and entertainers and seen some of the world's most beautiful places. I've been drawing on cruise ships since the 1980s and drew extensively on ships about 9 years ago. Everything came to a screeching halt with the onslaught of the recession and finally I'm back again, smelling that salt air, eating more times a day than is ever possible at home. What makes it extra special is my better half, Robin (Pippi), who is an immensely talented artist. We sit side by side and enjoy every minute of our time together. Passengers have totally been into our thing and I guess that's why we keep getting asked back. This fall we'll be on one ship for about three and a half weeks.. a long one for us. Drawing on computer has its challenges on dry land, but then add the gentle (or not so gentle) rocking of massive ship and there is a whole new kind of challenge. I remember trying to draw digitally about 8 years ago, the equipment was much heavier and slower, monitor much lower resolution. I don't know if it was that or the inside room I was drawing in that sported no windows but the minute I took stylist to tablet, the waves of nausea erupted in my body. I thought maybe that was the end of that idea, perhaps I was destined to always draw on boring old paper. Well, now it is no problem. We've learned how to combat the really rough seas and we've brought minimal packing to a new artform. Mobility is imperative on these vessels. And each entertainer must be able to handle his or her own baggage on their own, especially when going through customs. This year, we see some familiar places, but also see some new ones like Norway, Iceland, Scotland and France. We have become addicted to this lifestyle, something I wasn't sure would be for me. World class fitness centers, massages, enough food to feed a battalion, and great food, I might add... more entertainment than we can possibly see in a two week frame. Beaches, sun, cold, mountains, plains and everything in between. I've been on many cruises, both for personal and business reasons, 4 days to 14 days, and it's quite a different, rewarding experience going on the long durations. You get the chance to really relax, really forget about life's stresses back home. And develop some great relationships with some of the thousands on board. We have the best of both worlds, being allowed anywhere passengers go and in addition, go anywhere the crew goes. The crew has their own special stores, bars, entertainment, restaurants, etc. We can buy many of the same imported quality items passengers buy at a fraction of the price. Laundry service to room service, all for the asking. I will keep blogging through the year as we venture out and discover new friends, places and experiences. And I will most certainly keep drawing.. steady as she goes.